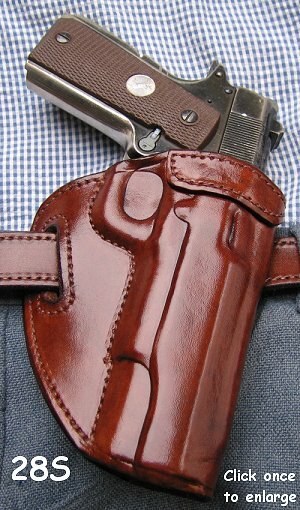 Model 28, 28S may best be described as an elegantly efficient workhorse, based on the classic wraparound design (see item on holster design). As with all Horseshoe holsters, detailed blocking and hand molding ensure positive weapon retention (see enlarged image). 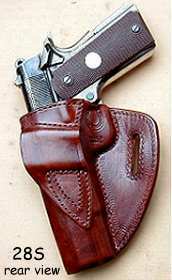 Unique to holsters of this type, it has a stabilising slot which combines with a rear belt flap to eliminate lateral movement. This additionally allows for really positive positioning over a trouser belt-loop, pulling the weapon close into the body for optimum security and concealment. Bonded sight-rails and a slight muzzle-rear rake come as standard to ensure an easy, snag free draw every time. 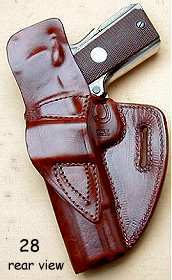 The mouth of the holster is reinforced for one-handed re-holstering, which makes this model particularly suitable for use with the wide-bodied autos (Glock, Sigma, Springfield XD, etc). 1 1/2" only in Saddle Tan, Cordovan, or Black (Click here for colour samples). To see an action demonstration of model 28, ensure your browser is Java-enabled, wait until this page has fully loaded ("Document Done" or "Done" in Status Bar) then Click this link.